Just found your website and love the topics! I've been planning our dream home for years on napkins and it's finally rising up from the ground. I am stuck on what the overall finished look/textures should be. I can't see everything being done with the same type of siding all over. And I'm thinking that the walk out basement part should be stone up to the first level, as well as a bit of stone on the bottom of the front pillars and garage to anchor the house. Also am planning on a wide fake chimney between the angled windows on the west wall - stone as well. It's really tough to visualize how it will all look in the end. Any thoughts? It's so much easier to change things around at this stage!! lol. Your blog is fun and often captures my interest. Excellent suggestions! Many thanks for the input! As for the turret, I was thinking of running stone around the entire first level of the walkout in the same stone material with wood siding above. (What do you think of matching the stone color to the roof material?) Then put a wide trim above the stone (thanks for the suggestion, Joffre!) and then the wood siding. This would leave 2 stories of wood siding sitting on 1 story of stone. The house colors I have not decided on yet, but am planning something light for the wood. On the upper stories, I was hoping that a textured piece of some sort (diamond-shapes with scallops inside?) within the siding would take the eye away from the height and add some interest. Maybe I could use a similar pattern to balance the offset windows somehow. Joffre, can you please explain a bit more on your notion of arches? It sounds really interesting, but I can't quite visualize it. I have ordered soffit material - seems to be very hard to find continuous vented soffit that looks like bead board in our area, but I have found some vinyl. Up that high, I am hoping it will look like wood. I will do the porch soffits in actual wood. I'm still shopping for stone and wood siding which is also proving to be a challenge. Red cedar is all I can find so far. Thanks again for all suggestions - it really is nice to be able to chat with people that have similar interests! Thanks for the sketch. It certainly clarifies what you are saying and it does look much better the way you have presented it. The sketch was to help show what I was trying to point out. When you take the gable end elevation by itself the empty space implies that something should be there. I actually wrote a blog post on exactly this subject: “Something is Missing“. In this case, though, if the trim boards frame the elevation so that it appears to be an additional large volume, then not only do the angled window support the overall shape of the elevation, but also the size and prominence of the turret is reduced by dint of the fact that now there are two large volumes instead of one. Even the little windows angled up the elevation above the porch now contribute to the overall composition. Further, if the foundation is finished so that it matches the color of the ground and if the basement windows are trimmed to match, the house settles down. Also, another visual trick is to use a light color trim where the house meets the foundation. Since our eyes are always drawn to elements of high contrast, visually we tend to see the base of the house at the top rather than the bottom of the foundation. Sorry for the bad sketch. Also, if I was working with this home owner I would do a number of sketches in different configurations to help them see what they like. I am not sure why a chimney would detract from the design. The way the windows are laid out on that section cries out for some kind of shape intervening between the windows and a chimney would make sense. I prefer real chimneys but fake will work. Since the windows are set in stone (or concrete anyway) the option of adding windows is out. I suppose you could add a shallow buttress. Not all that different from a chimney but not as big or deep. It would appear to reinforce the wall when in reality it is simply giving a reason for the large separation between the windows. As for the library, how cool is that? I love the idea. Unfortunately it does give you a slight problem with the upper part of the turret. I am going to suggest that you have your siding (Stone, or whatever) come out just a little further on the lower section than on the upper section. It will make it seem bottom heavy rather then top heavy. From there you could then create the look of having arches supporting the roof. These could be done with thinset dressed stone tiles and then fill in the arch with another type of stone tile. Well, perhaps I am getting carried away here. The point is a little visual relief is needed and you need to find a way to rebalance the turret. All those windows on the bottom make it seem top-heavy. And of course you need to photograph the finished house and attach them here or send them to me and I will do that. Best of Luck. Sorry, I forgot to put my name on the Nina Garcia comment. I have added it here. I don't like leaving people in the dark. Since you ask I would give you the same advice that Nina Garcia gives to many contestants on Project Runway (on Lifetime TV in case you have not seen it). Edit! Edit! Edit! Stone on the base is good. 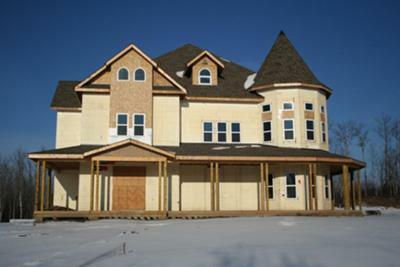 If you must use more than one siding material you may want to think about shingles for the turret only. A darker color will reduce the volume and thereby its prominence without cutting it in half. This house is an assembly of volumes, which is the strength of the design. I would play to that by minimize the wrap around porch. Let it be there but not lead. Also, you have committed to the "french chateau" aesthetic already with the 3 little birds nest window, the turret, the angled windows, too much more is going to be visually confusing and a fake chimney would outright detract from the design. Did you work with an architect? If so they should help you with these issues. You might want to look at some of the new engineered siding materials, especially the ones containing rubber. They have a very long life cycle. I believe that you said you used ICF's. How did that work out? Did you have any blow outs? Many, many thanks for the advice and your interest! You picked up on my main worry right away...the 'rocket' look of the turret on the back of the house. The room behind is a two-story library and windows really wouldn't work well from the interior perspective - besides the fact that the house is ICF block and it isn't that easy to cut holes in it. I'm thinking of using patterns/textures to try to compensate. Maybe one or two of those metal curved 'valances' above the windows (sorry....don't know what they are called). I like your idea of using a substantial trim between to break up the monotony. What do you think of the styrofoam moldings that glue on? Have you had any experience with these? As you can see in the photos, some windows are off-center (front and west) and I will need to get creative to handle these as well. Have you run into any houses that have had similar problems? I will look into the cedar you mention. 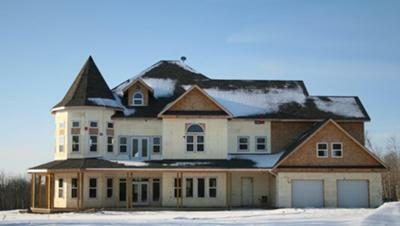 Shingles will be a 'for sure' on the gables. I still have to look into patterns, though. I really appreciate your thoughts on this. I think your instincts are good. Stone on the subgrade floor will provide weight on the bottom. If you decided to go with stone all the way up I would use a rusticated or natural stone on the bottom. This will seem heavier and more solid than a dressed stone, so the dressed stone would be used for the upper floors. However, you indicated that you are thinking of wood siding. I recommend Northern White Cedar. It should be relatively abundant up your way. It resists rot and holds paint well. I like the idea of having a couple of types of siding above the stone subgrade. The porch roofs on the East and South makes a natural break where you could change the siding, but on the back side you have a bit of a problem. The transition might seem odd, so I would recommend a molding strip to simulate a ledge. It's sole purpose would be to divide the two siding styles. It would need to be fairly substantial, several inches high and ideally protruding out several inches. It would come across even with the base of the porch roof and the rear deck. At least it looks like the two would line up. It is hard to tell from the pictures. However, assuming that you went with stone on the subgrade floor I don't think it is critical that you go with two types of siding on the main surfaces. You are going to have those porch roofs breaking up the monotony, except for on the Northwest side. There you have a an issue with the lack of windows on the upper floor. You have a lot of unrelieved wall there. I am very curious what rooms are behind those walls. I would be tempted to add windows there. Surely you could use some light in those rooms and it would vastly improve the look on the outside. You mention that you are planning on doing this with your own two hands. That is impressive and a little scary. 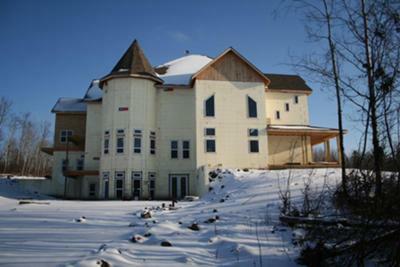 If you have done most of the house your self then you should be able to handle it, but any siding is a big project. Vinyl is the easiest for a DIYer to handle, but I am with you in disliking it. Cement board is a favorite of mine, but it can have issues if not installed by someone who knows what they are doing. If you go that route try getting some professional assistance or training. Of course the stone work, even if is a veneer, is also skilled endeavor. I would try adding some shingles to the gable. You don't have to go all Victorian. The shingles will go well with the stone and can seem quite natural, if that is the look you are going for. I am running up against my 3000 character limit, so I will stop for now.